The manufacturers involved in ene.field (Baxi Innotech, Bosch, DanthermPower, Elcore, Hexis, RBZ, SOLIDpower, Vaillant and Viessmann) will be deploying micro-CHP systems in real world situation within a range of European Households. Up to 1,000 systems will be deployed across 12 EU Member States and their performance will be evaluated over a 3 year period. Both technologies have been proven to operate at high efficiency and promise strong potential to deliver carbon emissions reductions from household energy consumption. ** The systems deployed in ene.field have various sizes and electrical and thermal outputs. The ranges displayed in the above table represent the range of sizes and outputs of the products from the 8 manufacturers involved in ene.field. The systems will be monitored with state-of-the-art monitoring equipment that will feed valuable data into a series of important analytical studies, including: technical and performances analysis, lifecycle cost assessment and environmental impact assessment. This will allow the project to deliver an evidence-based cost and environmental performance analysis, to be used to accelerate the adoption of the technology, encourage policy support from governments and facilitate the establishment of new channels to market. establish co-operation between the manufacturers involved, to share experiences and lessons learned. Fuel cell micro – combined heat and power, or fuel cell mCHP for short, is a technology that uses a single fuel (hydrogen, natural gas or LPG) to produce both heat and electricity for a building. There is growing potential for the use of these micro-cogeneration systems in the residential sector since they have the ability to efficiently produce both useful thermal energy and electricity from a single source of fuel. These products are used or aimed for meeting the electrical and thermal demands of a building for space and domestic hot water heating, and potentially, absorption cooling. 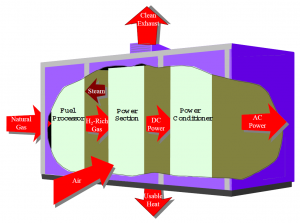 Different micro-CHP systems produce different levels of heat and power depending on the building’s needs. 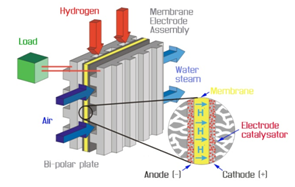 Fuel Cell mCHP for instance primarily produces electricity with heat being produced as a by-product. This means the technology is perfectly suited to buildings with low heat demands and high power needs. The fuel cell works by combining hydrogen produced from the fuel and oxygen from the air to produce dc power, water, and heat. In cases where CO and CH4 are reacted in the cell to produce hydrogen, CO2 is also a product. A system must be built around the fuel cells to supply air and clean fuel, convert the power to a more usable form such as grid quality ac power, and remove the depleted reactants and heat that are produced by the reactions in the cells. Water is created in the electrochemical reaction, and then pushed out of the cell with excess flow of oxygen. The net result of these simultaneous reactions is current of electrons through an external circuit-direct electrical current. The hydrogen side is negative and it is called the anode, whereas the oxygen side of the fuel cell is positive and it is called the cathode. Each cell generates about 1 V, so more cells are needed in series to generate some practical voltages. At the heart of a PEM fuel cell is a polymer membrane that has some unique capabilities. It is impermeable to gases but it conducts protons (hence the name, proton exchange membrane). At the interface between the porous electrode and the polymer membrane there is a layer with catalyst particles, typically platinum supported on carbon electro-chemical reactions happen at the surface of the catalyst at the interface between the electrolyte and the membrane. Hydrogen, which is fed on one side of the membrane, splits into its primary constituents-protons and electrons. Protons travel through the membrane, whereas the electrons travel through electrically conductive electrodes, through the outside circuit where they perform useful work and come back to the other side of the membrane. At the catalyst sites between the membrane and the other electrode they meet with the protons that went through the membrane and oxygen that is fed on that side of the membrane. 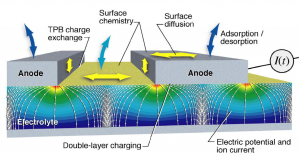 As with the other cell types, it is necessary to stack SOFCs to increase the voltage and power being produced. Because there are no liquid components, the SOFC can be cast into flexible shapes; tubular, planar. Development work for cells operating at 1000°C is focused on increasing the mechanical toughness of the cell materials to alleviate the impact of thermal mismatch and to develop techniques that will decrease interfacial changes of the various material layers during thin film cell fabrication. 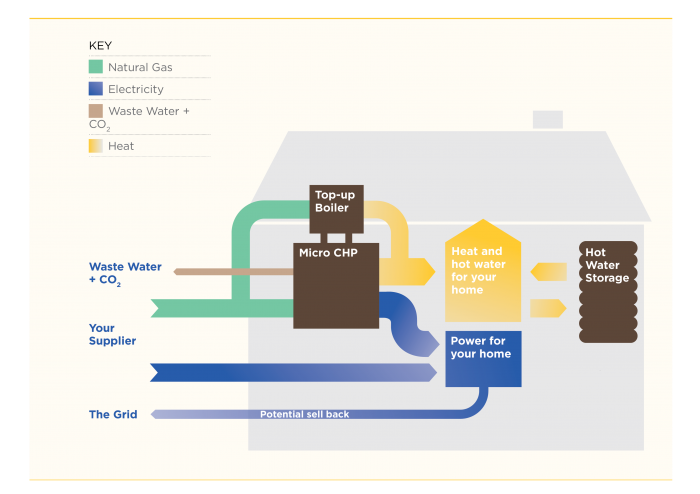 The fuel cell systems offer many potential benefits as a distributed generation system. They are small and modular and capital costs are relatively insensitive to scale. This makes them ideal candidates for a diverse amount of applications where they can be matched to meet specific load requirements. The systems are unobtrusive with very low noise levels and have negligible air emissions. These qualities enable them to be placed close to the source of power demand. Fuel cells also offer higher efficiencies than conventional plants. Fuel Cell Handbook (fifth edition), EG&G Services Parsons, Inc., 2000.